Remember, batteries are rechargeable. It is always a good idea to carry jumper cables in your vehicle in case of emergencies. You never know when you may need to jump start your vehicle, or even help out another driver in need. Once your battery has reached its limit, recycle it! Recycling batteries can reduce the resources required for manufacturing new batteries. When you recycle your battery, you can also divert toxic lead from landfills or improper disposal. Come in today for all of your battery care needs. 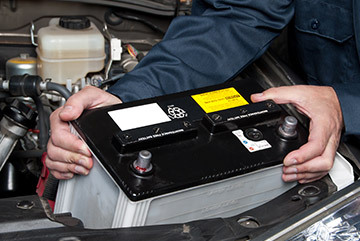 We can help you choose the right battery for your vehicle and lifestyle and our staff can safely and professionally install it to get you back on the road!